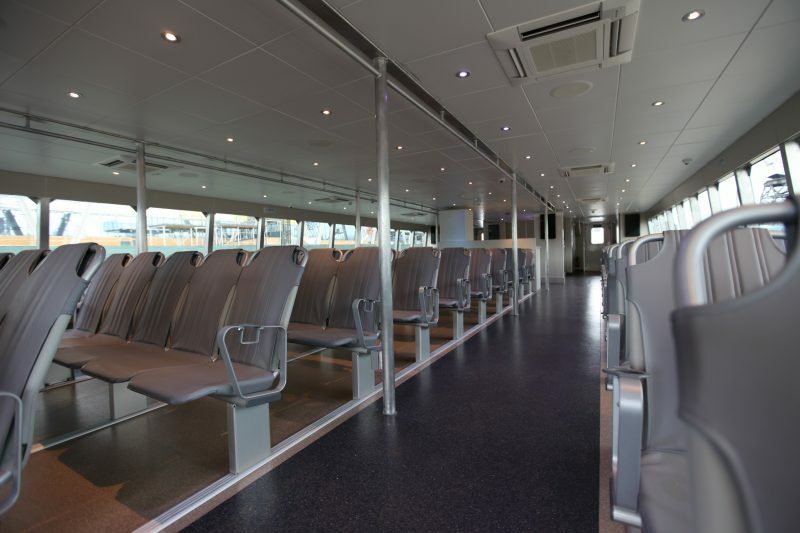 New “Ocean Queen Rockstar” ferry boat equipped with Freedman marine seats sold through Suburban Seating. 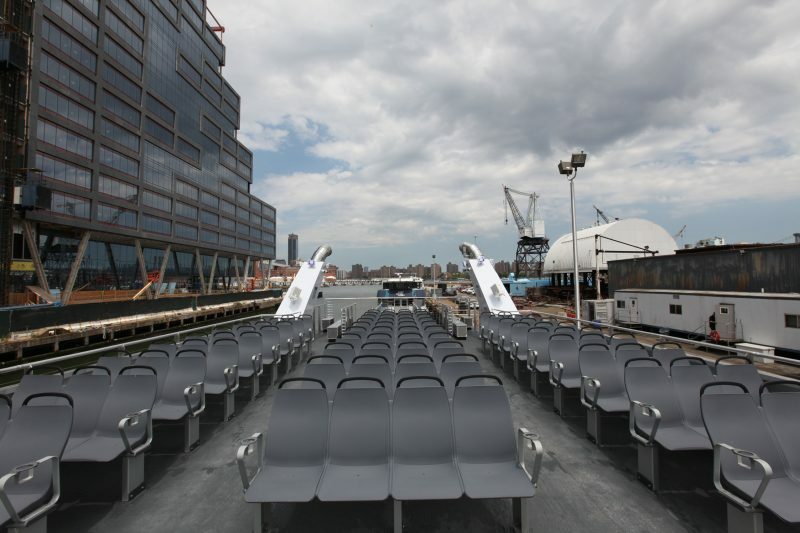 Brooklyn, NY – New York City Economic Development Corporation (NYCEDC) announced today that Ocean Queen Rockstar, the first 350-passenger capacity vessel to be part of the NYC Ferry fleet, has arrived at the NYC Ferry Homeport at the Brooklyn Navy Yard. The larger-capacity vessel will help alleviate record-breaking ridership across the system, which, as of today, has served five million passengers since the service launched in May of last year. For more photos and a video of Ocean Queen Rockstar, click here. Ocean Queen Rockstar is the first of six higher-capacity boats that are outfitted with larger engines and substantially more seating on the top and bottom decks to accommodate more passengers. The vessel completed a mandatory sea trial to ensure it is fit for service before journeying 2,200 nautical miles from the Gulf Coast to New York Harbor earlier this week. Prior to going into service, Ocean Queen Rockstar is undergoing final installations, modifications and testing. The boat will join the 16-vessel fleet currently operating across four routes at the end of July. “We’re excited to welcome our first 350-passenger vessel to the NYC Ferry fleet! 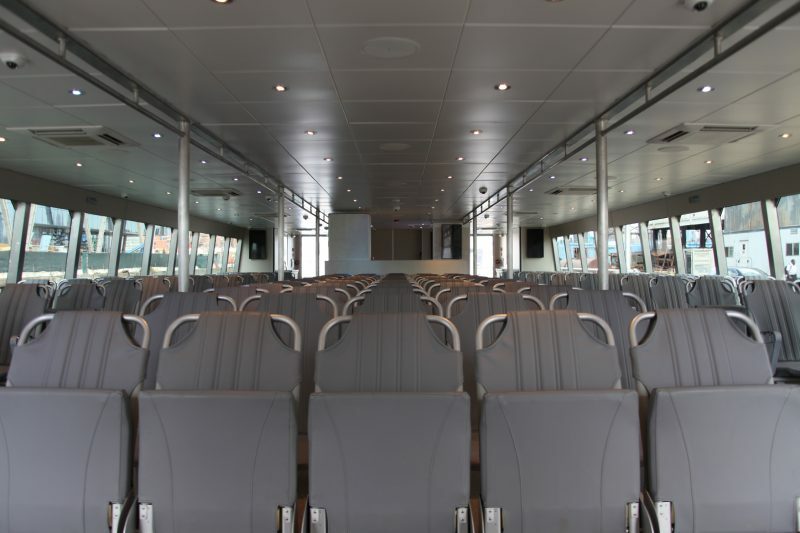 Ocean Queen Rockstar will help us meet growing demand for this service and get even more New Yorkers to their destinations throughout the city,” said NYCEDC President and CEO James Patchett. The introduction of larger vessels to the NYC Ferry fleet is in response to unexpected ridership demand the system experienced during its inaugural year. NYC Ferry experienced record-breaking ridership this week, serving nearly 75,000 riders last weekend, and ultimately serving 5 million riders total as of today. 2,635,492 riders on the East River Route, which launched May 1, 2017. 842,300 riders on the Rockaway Route, which launched May 1, 2017. 744,218 riders on the South Brooklyn Route, which launched June 1, 2017. 738,864 riders on the Astoria Route, which launched August 29, 2017. 11,821 riders served through its Governor’s Island summer weekend service. Earlier this year, Mayor de Blasio announced a plan to invest $300 million in capital over the next five years to secure additional higher-capacity vessels, improve existing piers and docks, and build a second homeport where the growing fleet will be housed and maintained. The investment follows updated projections that NYC Ferry’s ridership could grow to as many as 9 million annual passengers by 2023, twice as many passengers as initially projected. Ocean Queen Rockstar is one of 10 vessel names chosen by the City’s second-graders that participated in the 2018 NYC Ferry vessel naming competition. Click here to watch a brief video announcing some of this year’s winning names. Since its launch in May 2017, NYC Ferry has already employed over 325 people to fill positions such as captains, deckhands, customer service agents, ticketing, operations and more. New Yorkers of all backgrounds and skill levels are welcome to apply. Jobseekers can apply directly at ferry.nyc.